A crescent moon & stars accompanied us, along with a pretty pre-dawn sky to the east on our blink of a trip to Port Clinton. But, brrr, it was cold. Lots of clothing layers, along with mukluks, double gloves & my Phillies cap with ear flaps were needed. Pulled into the playground area and got the boys setup, while Dave & Missy were getting their furkids setup. Shawn with Tikaani was the first to arrive, shortly followed by George with Beowulf & Grendal. Cinnabar weighed in at 111, Sebastian at 138. This location is next to the Schulkyll River and between two big hills. Because of the hills, it takes a while for the sunshine to reach us in the little valley, and it sets quite a bit sooner. Dave Heffelfinger was our chief judge. I judged the 40lb class (about 8 dogs - 90 lb increments), 60lb class (about 10 dogs - 90 lb increments), pulling together. Dave judged the 80/100/125/150 classes (about 14 dogs pulling 180 lb increments). A couple old timers pulled for fun in the 40lb class, Dyna and her brother Bear. Both did well, with Bear winning the class. Odin (Beagle) came in second. He really pulls well when he's not barking. One of his first pulls, he ran towards the side of the chute and barked twice at me and then went on with his business. It was hard to not laugh out loud while he was still pulling. Electra easily won the 60lb class. The 100lb class included Shawn and Tikanni, who'd done well in Novice again. He beat his goal of 1200 lbs and looked very good doing it. Also in the 100lb class was Di Ane and Macha (American Bull Dog), whom I met at last year's Tails on the Trails demo. She'd pulled a couple rails pulls prior to this, and this was her first time pulling wheels and she went over 2000 lbs, doing great! Along with another Diane and her Brie (Rotty), who intended to show up for novice, but misread the time and got there for pro. I'm glad that happened, because Brie also went over 1200 lbs. Nanook was interesting this afternoon. For some reason, he needed to go see the cart help prior to giving an effort. It was easy for him each time he gave an effort, but he was being a bit of a brat. I think he's been watching Sebastian too often - LOL! 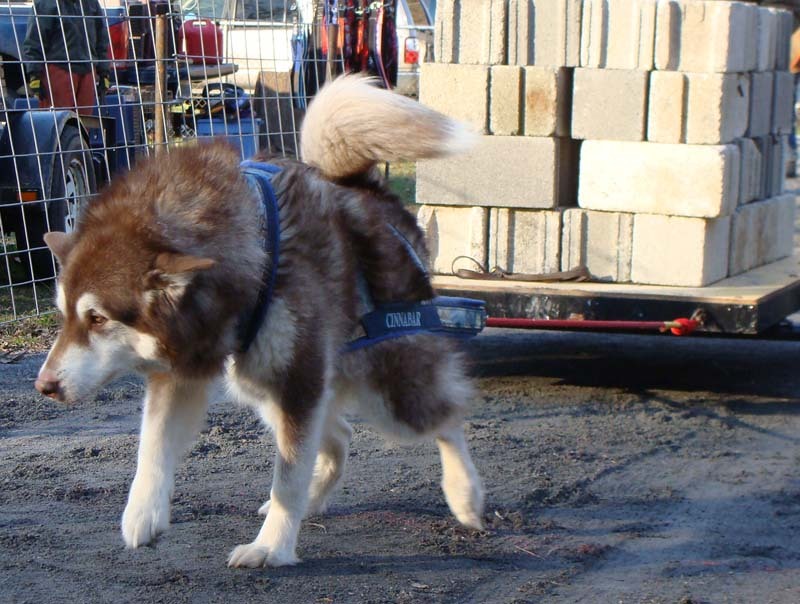 Missy's Homer (Alaskan Malamute) and Evo (Pressa) also looked great in the 100lb class. 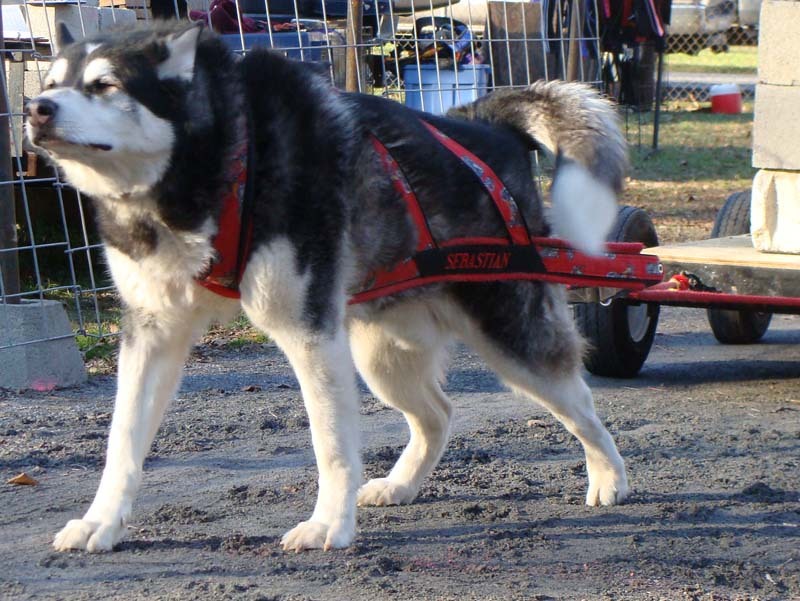 The powerhouse Beowulf (Alaskan Malamute) easily won the 100lb class, in addition to getting MWP (most weight pulled) and BBP (best body percentage). We've also got to lookout next season, his younger brother Grendel pulled in novice at 7 months old and did quite well, too. That's going to be quite a one-two punch next season! The chute was very good, hard packed fine gravel. It got much tougher when the weights got higher if there was a rut. I started my boys at just over 1000lbs and double passed them up to 3000lbs. Then I single passed Cinnabar, then no passes. I switched off their pulling order each time, so each of them had lots of mom time, although much of Cinnabar's mom time includes socialization with the folks within leash reach. He successfully pulled 3540 after just a smidge of talking. His next pull was 3760, and I carefully watched Beowulf pull it to see if there were any ruts. Didn't seem to be. Well, on his 3760 pull there was some talking, then he hit it, then more talking. I was yelling "dig, dig, dig" and boy did he, but he didn't budge the cart and timed out. Harley (St. Bernard) did the same thing. Cinnabar took second to Harley in the 125 lb class on time pulling 3540 lbs (31.89%). He lost by two tenths of a second! Sebastian was quite a baby during his mom time, with just a tad of socializing with other folks. He kept laying his head into me and giving me his paw. He also was very stubborn about going into his crate after he pulled. He's 7 1/2, and this is a first. Sometimes I tricked him into the crate, one time I pushed him in. He was just giving a very pretty sit in front of the crate, giving me a paw and looking for a treat which wasn't going to happen. I consistently double passed him, as he was solo in his class. He was pulling everything easily, hum-de-dum. He made his 3180 pull and I double passed him, so his next pull was 3760. After both Cinnabar and Harley got stuck in a rut right off the bat on that pull I had them move the cart a few inches to the right. He started out great, and I think I messed him up by not staying as far back from him as I had in previous rounds. He left it 8 inches short. He did try to start it again, but the gravel at that point is soft from all the dogs digging in and he couldn't budge it. He really did try and Shawn gave it a push on that try, so he thought he got it. He finished with 3180 (23.04%). Thank you to Laura, for grabbing those shots of my boys! After Beowulf pulled a couple more rounds (was able to get some good shots of him), it was time to unload the cart. It's tough with a light crowd, but we got it done. Then time to pack up the car & the boys and have awards. The sun had already "set" behind the hill and it was only 3:45pm. While this was a small pull, it was a good one. I certainly enjoyed getting out of there at a reasonable time, as did everyone else. Next pull at the Port is January 29th. Thank you Missy and Dave for putting on the pull!